Rare variant pair armchairs P32 Osvaldo Borsani for Tecno, Italy, 1950. 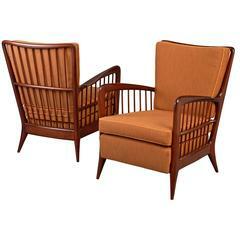 Pair of Contour lounge chairs, with structure made of mahogany and upholstered in similar leather. Completely restored. 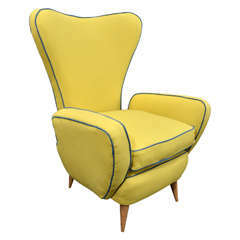 A Classic pair of wood frame upholstered armchairs, circa 1950, by Paolo Buffa.